Tomás mate? “Do you drink mate” Is a question I hear often as a norteamericana. 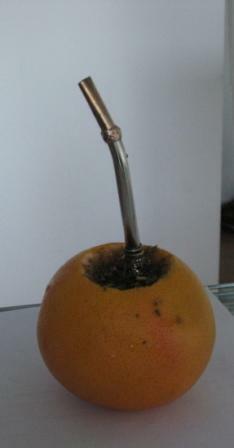 The photo is of a bombilla (the sifting straw) in grapefruit. The dry yerba mate (leafy substance similar to tea) sometimes has citrus added. 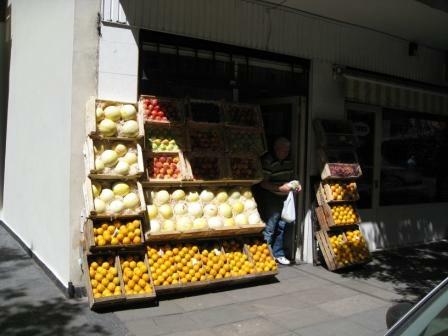 V. suggested that we try the yerba mixed with the meat of the pomelo, grapefruit, from her stall. The water can’t be boiling–that ruins the mate taste. The drink is pronounced “MahTAY.” The tradition is for one maté host/server to get a thermos ready and fill the “mate” (mate container) with hot water for each person sharing. After a person is finished, he or she passes the mate back to the server without saying gracias. “Gracias” is reserved for when a partaker is finished. (Yes–just like the polite finish to a tango!) It is difficult to get used to not saying gracias when someone gives you the mate. Some hosts add a little sugar to take the edge off the yerba. The host also replaces the yerba when it loses the flavor. This was my feeling when I first arrived—learning the subtle movements and navigations of Buenos Aires I needed to see me through. Not only did I need to learn the literal language, I needed to learn the other language—the preferences and inclinations of the people. Do you believe that residents of different countries have different walks? Someone told me this. I imagined myself delicately posing behind complete strangers on the sidewalk, trying to follow their lead and walk in step. A little faster? A little to the right, the left? This is madness, I said to myself. How can I learn another countrymen’s gait? I’m beginning to believe that once a foreigner, always a foreigner. I have always been a tourist, but never a resident. Here I am neither resident nor tourist. According to Argentines, I am an “extranjero”—a foreigner. Another derivative of this word is the word for “extraño” for strange. I am strange—I feel extranjero leeching into my cells here, my blood, mi sangre, a cool disorientation.